As a night owl, waking up early in the morning is one of the hardest things for me to do. Night me is always screwing over morning me by staying up way too late. In the past I have always played an internal game of chicken, pushing the limit on the number of times I can hit the snooze button while still getting to work on time. Waking up to exercise in the morning was inconceivable. However, some way, somehow, the last few weeks I have been managing to get up early to play tennis before work. I have always been an avid tennis player, which meant playing late at night with my old habits and startup hours. I found myself in a terrible cycle of leaving the office late, rushing to tennis, eating dinner super late, and feeling the need to unwind for a couple of hours afterwards. This led to many late nights and groggy mornings. About a month ago, a friend was telling me how much she loved going to the gym before work. It did sound good, but I still didn’t think it was for me. Then I got super lucky in having a co-worker who has a similar passion for tennis. I got him to join my tennis club and suggested we give playing in the morning before work a shot. Three weeks later and we haven’t looked back. Playing outside in the morning sun and less windy San Francisco weather is awesome. My general morale is so much better throughout the day. 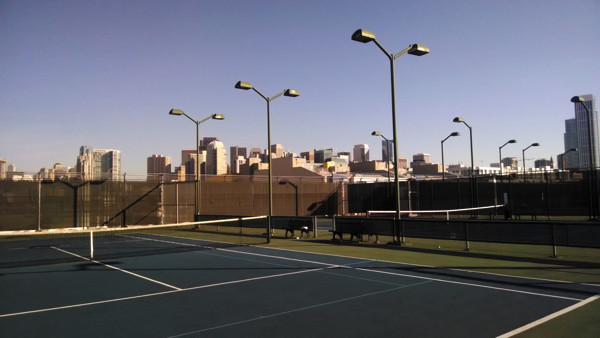 Something about being outside, soaking up the sun, and playing tennis makes me feel so good. It seems to free me of the feeling of being in a recurring, forced, prison like schedule of having to wake up and go right to work. I get into the office at roughly the same time, but it feels very different. There is also a great sense of accomplishment in getting some exercise out of the way so early. I want to and do enjoy exercise, but sometimes after work it feels like a chore. After playing tennis in the morning it feels like everything else I do for the day is a bonus and for some reason I seem more inclined to do more. Possibly the best side effect is how awake I am from then on. I feel energetic and loose when I get to work. I notice myself getting into my actual work much quicker and being able to concentrate for longer. It might be in my head, but I also think I feel more comfortable just sitting at my desk. I’m not going to lie; it is still a struggle when my alarm goes off to actually get out of bed and get to the courts, but it is worth it. After already seeing noticeable improvements in my overall fitness, tennis game, morale, and work performance I had to write this blog post. It really is improving my day to day life and it is something I hope more people will try out. Fellow non-morning people, trust me; it is worth it! Let me know in the comments below if you prefer exercising in the morning or night! What insights have you found with each?